Francine Ajzensztark Taylor was born in 1928 in Karczew, Poland. In 1931, her father, a tailor, moved his family to Paris to escape Polish antisemitism. He became involved with the French Underground during World War II and was killed at Auschwitz following his arrest. Francine, Suzanne, and their mother, Germaine Königsberg Ajzensztark, survived by hiding in rural France and using false identification papers. After the war ended, the women returned to Paris, where Francine and Suzanne found work at Orly Air Base. Francine met Harry Taylor, an American serviceman, while working at Orly, and, in 1949, the two became engaged and returned to the United States. They eventually settled in Charleston, South Carolina, with their two sons. Francine and her friends, taken in Graulhet, France at the end of 1942, during the war in free France. Front row, left to right: Suzanne ?, Maurice Rubinsztein, Francine. 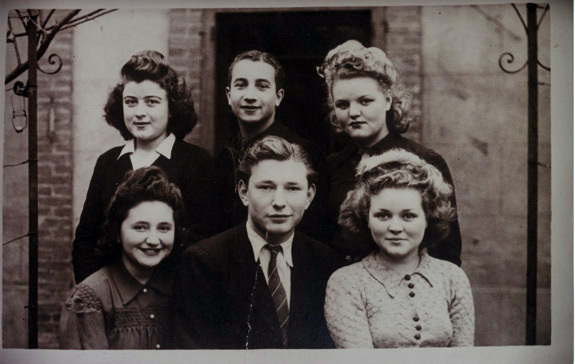 Back row, left to right: Annette Lautard, Henri ?, Suzanne Ajzensztark (Francine's sister).